~ Abby and Noah, both 19, are near a warehouse district vandalizing some walls with graffiti, one of the tags being "Murderer." Noah is more nervous about doing this than Abby, and is wanting to leave when the screech of a car around the corner startles them both. After checking to see what happened, they determine it was just a fender bender and proceed to tagging more of the walls. When the cars vroom off, they peek around the corner and see a body lying next to where the cars were once parked. ~ Flack and Lovato are the first to arrive at the scene. ~ The episode seems to delve into the world of NYC pizzerias. At one point, it seems like someone may have been killed over mozzarella. Anna Belknap is happy to be doing another season of "CSI: NY," though she didn't necessarily expect it. Now in its ninth year, the CBS crime drama faced the very real possibility of ending last spring, with its season finale -- in which forensics team leader Mac Taylor (Gary Sinise) was mortally wounded -- suggesting the cast and crew were braced to wrap things up for good. Instead, "CSI: Miami" became the part of the franchise that was canceled, and Belknap has gotten to continue as New York police detective and lab expert Lindsay Monroe Messer. "That last time we were all together, we were taking a lot of pictures. It's a huge chunk of all our lives, and I was obviously hoping we'd come back, but I didn't want to hope too much. I just really wasn't sure." The current "CSI; NY" round has offered a bigger dose of Lindsay's family life, with recent episodes focusing on her as a mother and a daughter. Belknap, who has been with the show since its second year, is glad it's letting in more of its characters' personal lives ... even as she admits she's still working on balancing her own life as a steadily working actress and a mother of two. "It's always hard," she allows, "as everyone who has kids knows. I always realize when I'm at work that I do need to get away from the house, that it's important for me to have a life outside. At the same time, when I'm having a really long day, I'm like, 'I have to go back and be with my kids! What are they doing? How are they?' It's always a struggle for me, that thing of trying to feel like you're not letting anyone down too much." CBS is the final broadcaster to unveil its midseason game plan, and highlights include the return of Rules of Engagement, a special Tuesday launch for the new cop drama Golden Boy and a February season finale for CSI: NY. Emmy award winner Edward Herrmann will visit CSI: Crime Scene Investigation this February, I have learned exclusively. Herrmann, who has a recurring role on the CBS drama series The Good Wife, will visit CSI this February for the crossover event taking place with CSI: NY. The episode, “In Vino Veritas,” has the well-established actor playing Mr. Vogel, a wealthy broker/auctioneer of high end, rare wine who enjoys good food and good wine. Co-Executive Producer Rick Eid penned the episode with Louis Milito directing. 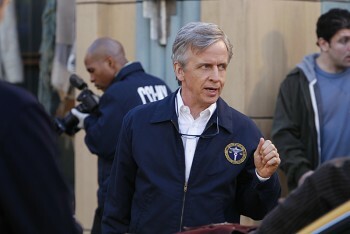 In addition to The Good Wife, Herrmann is known for roles on The Practice, Gilmore Girls, and Oz. His CSI episode airs February 6. 9.15 - "Seth and Apep"
~ Not much to offer at this point. Christine is still missing, but she is now in NY. She's not the only one who has been kidnapped. ~ D.B. Russell from Las Vegas is in New York. At one point Mac is M.I.A. Jo, Flack and Russell are not aware what Mac is up to, and Russell volunteers to go find Mac. ~ Christine is somehow connected to some missing diamonds, but I don't know the full extent of that plot. ~ While Mac does not seem like the kind of guy who would be a vigilante and assassinate someone, we do see him put to the test and may see him do something like we haven't before. ~ Flack is put in a difficult position when it comes to what Mac has to do to find Christine. Ausiello: Fans of “Flovato” (aka Detectives Flack and Lovato) should find themselves quite happy with the next new episode back, airing Jan. 4. ~ This is the penultimate episode of Season 9. ~ There's a Valentine's Day theme to this installment. Flack and Lovato appear to still have a 'thing' for each other. Lovato reminds him that it's Valentine's Day, and he asks if she wants to do something later. ~ Not 100% sure, but there appears to be multiple cases in the episode--possibly more than two. From what I gather it's similar to the original CSI's "Toe Tags" and "Kill Me If You Can" episodes, where there's a different title for each case. One of the titles is "Love Is Blind." ~ Danny and Hawkes work a case involving a mismatched couple, and Hawkes makes a quip about how Lindsay choosing Danny is far fetched. ~ Mac meets up with Christine at a piano bar for a Valentine's Day dinner. This week on CBS’ CSI: NY, matters of love and… well, mortality… loomed large, as one crimesolver pulled the trigger on romance, while another was dealt an entirely different hand. Co-executive producer Trey Callaway, who penned the hour, gave TVLine the inside story on both developments and previewed what comes next. STOP, IN THE NAME OF LOVE | On the happier note, “Flavato” fans — aka those who’ve been wanting Detectives Flack and Lovato (played by Eddie Cahill and Natalie Martinez) to become partners in a very different way — saw the new year get off to a promising start, as the duo went on a date (and even got a bit physical). 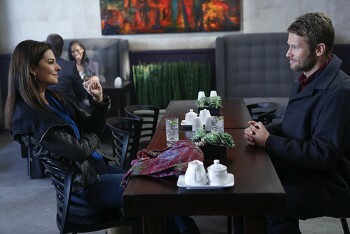 RICH MAN, POOR MAN | More significantly, CSI: NY‘s winter premiere shared two big reveals about Sid. One was surfaced by Jo, who discovered that an anonymous “Guardian Angel” who’d been gifting downtrodden individuals with million-dollar checks was none other than the mild-mannered M.E. But it’s the why of Sid’s largesse that shook longtime fans: As confided to Jo, he’s been diagnosed with non-Hodgkins lymphoma. Robert Joy had been prepped for the curve "CSI: NY" threw him, but that didn't necessarily make it easier for him to play. The CBS series airs a new mystery about an off-duty policeman's murder Friday (Jan. 11), but in last week's episode, forensic detective Jo Danville (Sela Ward) determined that Chief Medical Examiner Sid Hammerback (Joy) -- now quite wealthy, after selling the patent for a special pillow he devised -- was the secret distributor of $1 million checks to survivors of crime victims. And that wasn't the biggest reveal: In an emotional closing scene, Sid then confided to Jo that he had been diagnosed with non-Hodgkin's lymphoma. "To have such a meaty scene in a police procedural was something beyond my expectations," Joy tells Zap2it. "I was warned about it, so I knew the big news would be coming, but Trey Callaway (the 'CSI: NY' co-executive producer who wrote the episode) and Pam Veasey (an executive producer of the show) reassured me that they weren't interested in ending the character. Primarily, they're interested in the potential of having someone on the team living with cancer. "We all know someone who is, and it's an interesting phrase. We used to say people were dying of cancer, and I think more and more, these conditions that used to remove people from their workplace and community are now making their involvement more urgent. I certainly know people living long lives with cancer, even though (their cases have been diagnosed as) 'incurable,' because there are so many treatments to extend and improve the quality of life." As moving as Joy's performance of Sid's revelation was, it was matched by two-time Emmy winner Ward, whose Jo tearfully asked Sid if he was in pain ... then agreed to help him keep his situation as private as possible among their other colleagues in the New York crime lab. "Watching the whole episode, I was amazed by how Sela was such an anchor," Joy reflects. "She's the one who's hit with the news. Sid has known this for some time, so she had to take the blow, and she really showed what a thoroughbred she is in the acting department. You realize what resources she has a performer, and how deep she can go. That's an incredible blessing for us." A veteran of such movies as "Ragtime" and "Waterworld," Joy notes that since Sid is known as something of an eccentric, his suddenly wearing a hat at work or practicing yoga in a corner of the lab could be taken only as that, and not necessarily as a sign of the illness that only Jo will stay aware of for the time being. "When I count the number of things Sid has been interested in over these eight years I've been on the show, it's kind of amazing," Joy muses. "He's a chef, he's a ballroom dancer, he's always been someone who tries to live life to the fullest. And now, that dial has been turned up and everything is more urgent for him." Introducing such a critical, ongoing element to a familiar character now would seem to signal CBS is giving "CSI: NY" serious consideration for a 10th season ... as would the two-part episode that starts on "CSI: Crime Scene Investigation" Wednesday, Feb. 6 and concludes on "CSI: NY" two nights later. However, Joy maintains he's as much in the dark as anyone about a possible renewal. "The writers made it clear that they were going to look into the private life of each member of the team this season, and they've done an amazing job of it. I know it's gratifying for them, but it's also very generous to us as a cast. It's almost like a gift. If we are coming to the end of the run, it's a beautiful thing to do. Why go back to business as usual if we can keep doing new business?" ~ This is the Season 9 finale. ~ Whereas in the past few years finales have more of a personal component to them, 9.17 seems more case-driven... case of the week. The police are suspected of killing an unarmed suspect, despite them swearing to their grave that the perp was carrying. ~ A group of protesters breaks into NYPD. Mac and Flack are in the middle of an interrogation when chaos erupts on the floors. Friday's CSI: NY is a bit of a numbers game. But the number is most significant to Sela Ward's Jo Danville, who lost her sister in a car accident that happened on Sept. 13. On her day off, Jo learns a shocking secret about her sister's death: She was an organ donor, and the man who received her heart (guest star Johann Urb) has tracked Jo down. "I am fascinated with people who are donors," executive producer Pam Veasey tells TVGuide.com. "I'm fascinated by those who can give up a kidney and continue living their lives. But I'm also fascinated by donor stories — by the fundamental idea that often someone has to die to for someone else to live. What about the people who are left behind? And what if you were ever to bump into the person who got that part? "This young man figured it out and tracks Jo down and wants to say thank you," Veasey continues. "And it's a secret we learn about Jo. We have never mentioned her having a sister before. That was a way of introducing a lot more about Jo and it's a beautiful story." Even though Jo's sister has never been mentioned before, Ward says audiences will understand how important she was to Jo. As such, this chance encounter offers Jo some peace. "She is so overwhelmed and blown away by this experience, and probably changed forever," Ward says. "She even asks if she can listen to her sister's heart. She leans down to his chest and really gets to feel that [her sister] carries on — that she is hearing a little piece of her that still is very much alive. So I think that closure for Jo was a very healing connection." Even so, Jo will be a bit suspicious of the man. "She asks a lot of questions of this person: 'What do you do? What did you become?'" Veasey says. "When you see he's standing there really handsome and healthy and [with] a whole life ahead of him, I think Jo [knows] that it's such a tremendous gift. There's a loss, but she can look up and smile and know that there was a gain." Ward says she was grateful to get to play such a touching, personal story. "It was like [the writers] handed me the biggest gift ever," she says. "On procedural shows like this, you tend to be starving for those kinds of story lines. It's [usually] all about giving information and helping fill in pieces of the puzzle for the audience to help solve a crime. ... It was just nice for me as an actress to be able to have something emotional to play." Although the show may not touch on it again, Veasey says she believes Jo and this man "will be connected forever." And it's that element of the story that she hopes sticks with viewers. "I hope it encourages... someone to think, 'Yeah, that would be nice to leave life and be a donor,'" she says. "It's not like I'm a huge advocate waving donor signs or anything, but... I wanted to give a really special shout-out to the families who lose someone, and those people have chosen to give something to someone else." Watch a clip of Jo's reaction to the news below. CSI: NY airs Fridays at 9/8c on CBS.